THE ULTIMATE ALL STAR ROCK BAND! Imagine the electricity in the air if rock royalty like Rod Stewart, Joan Jett, Stevie Wonder, Ringo Starr, Pat Benatar, Led Zeppelin’s Jimmy Page, ZZ Top’s Billy Gibbons and other superstars got together for the greatest jam session of all time! That’s the concept behind Las Vegas’ new supergroup show band, The Spirit Of Rock N Roll. 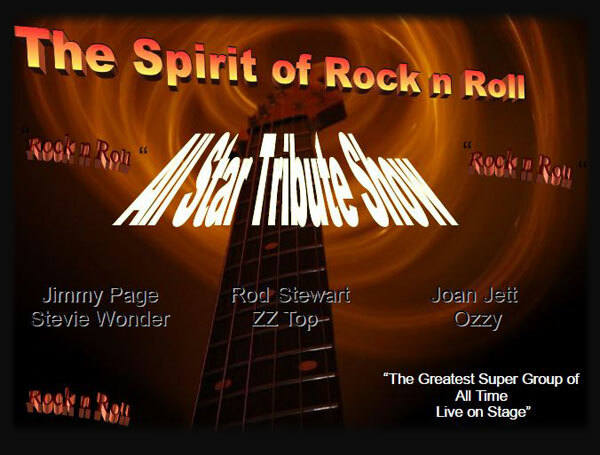 This incredible act features the industry’s premier rock tribute artists playing the music and singing such classic hits as “Hot Legs”, “I Love Rock & Roll”, “Superstition”, “Hit Me with Your Best Shot, “Rock & Roll”, and many more. With a rotating cast that will also occasionally feature icons like Elton John, Jim Morrison, Tina Turner and others, The Spirit Of Rock & Roll delivers a unique entertainment experience like no other. Current Line-Up Includes: Martin Andrew as Rod Stewart, Gina Diane & Carol Lyn as Joan Jett & Pat Benatar, Doug Starks as Stevie Wonder, David White as Ringo Starr, Ronee Pena as Jimmy Page & Billy Gibbons. The band debuted at Las Vegas Motor Speedway during NASCAR 2008, and is now the newest attraction in downtown Las Vegas at the Fremont Street Experience. The Spirit Of Rock & Roll is available in two formats: as a scripted full production showroom experience (synopsis available upon request), or as a straight-ahead rock & roll tribute band. While the ultimate goal is to present the full showroom production, these rockers are always ready to crank it up and bring it on. The Spirit Of Rock & Roll is represented by KEEL Entertainment, who have produced Las Vegas’ only country music show (“Country Superstars Tribute”) for over a year now, as well as representing many of the industry’s finest tribute artists and original acts such as K2 and Warryor. Manager/Producer/Entertainer Ron Keel calls The Spirit Of Rock & Roll “the most exciting rock tribute show in history”. See what everyone’s talking about! Wanna Book The Spirit Of Rock & Roll? You can book The Spirit Of Rock & Roll for your next event just by clicking the "Book Them Now" button to the right and filling out the form. We will be in contact with you about their availability as soon as possible.